Welcome to day five of Teen Sequins. 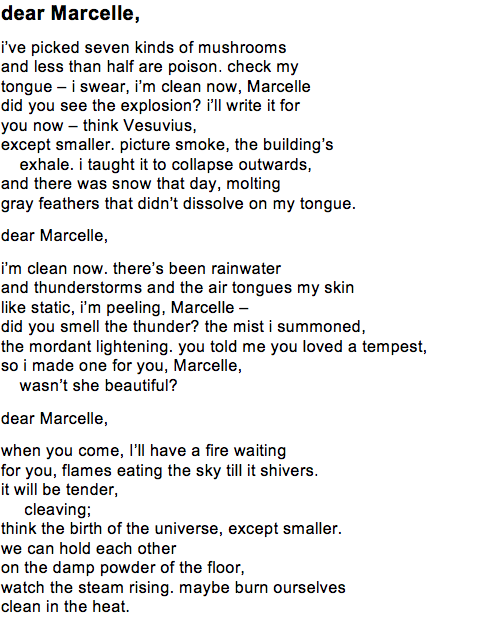 Today we’re featuring “dear Marcelle,” by Michal Leibowitz. Michal Leibowitz, 18, was born and raised in White Plains, NY. After high school, she spent a year in Israel where she studied, worked, and wrote poetry. Michal’s work has recently appeared or is forthcoming in Cleaver Magazine, Up the Staircase Quarterly, and the Winter Tangerine Review. Michal will be attending Stanford University in the fall of 2015. Posted on August 21, 2015 August 11, 2018 by sophie	This entry was posted in Uncategorized and tagged #teensequins, Teen Sequins, Teen Sequins 2015. Bookmark the permalink.